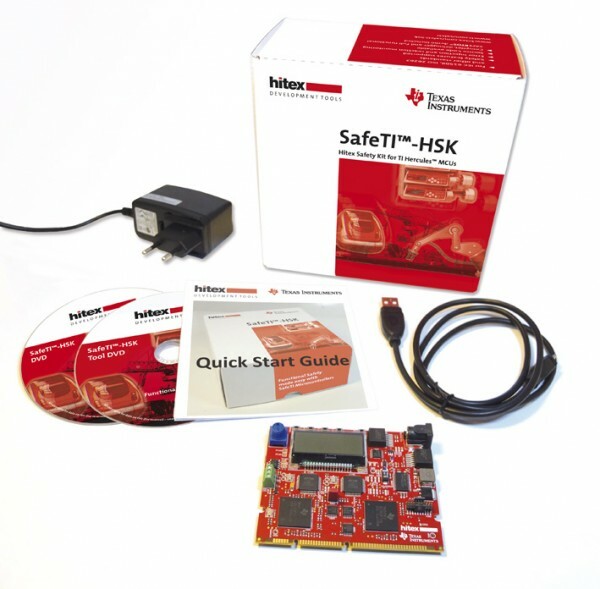 Product information "SafeTI-HSK Safety Kit RM48"
The SafeTI Hitex Safety Kit enables customers to easily test performance of their functional safety designs based on SafeTI components. The cost-effective hardware platform allows customers to evaluate individual TI hardware components – Hercules™ TMS570LS31x microcontrollers (MCUs) or RM48x MCUs (depending on the kit version) and TPS65381-Q1 power management integrated circuit (PMIC) – with TI’s Hercules SafeTI Diagnostic Library. Integrates key capabilities for fault injection, application of diagnostics, reaction monitoring and run-time profiling of fault diagnosis routines. Provides a demo software application which can be used as a starting point for evaluating TI safety MCU and PMIC combination chipset. Offers a user-friendly, host graphical-user interface (GUI) that provides capability to inject faults, apply diagnostics, profile run-time of fault diagnostics, time-stamp system response and set configurations; and communicates with the development board to request status information enabling visualization of system response timing. Includes a second MCU on the evaluation board, which acts as test control and monitor unit, and manages communication with the GUI. Includes an on-board JTAG emulator, accelerometer, temperature sensor and host/debug interface with a USB HUB controller and serial communication port converters. Utilizes an industry-standard DIMM form factor with 100-pin connector footprint for plugging into select TI motor control kits. Supports use of non-TI, third-party debug tools such as IAR and Keil, with a 20-pin external JTAG header for further design flexibility. Includes user-friendly documentation with a quick-start tutorial, user’s guide, hardware schematics and documentation for the diagnostic library to help ease evaluation and kit use. > HALCoGen – GUI based code generation tool. > Hercules SafeTI Diagnostic Library, offering a simple interface and a framework for enabling safety diagnostics/features recommended by the safety manuals. > Evaluation version of SAFERTOS™ from Wittenstein High Integrity Systems. > Includes well-documented source code for the demo application, the monitoring application and the diagnostic library. > Includes TI’s Eclipse-based Code Composer Studio™ IDE. Related links to "SafeTI-HSK Safety Kit RM48"
Customer evaluation for "SafeTI-HSK Safety Kit RM48"